Is the West losing out to China in Africa? 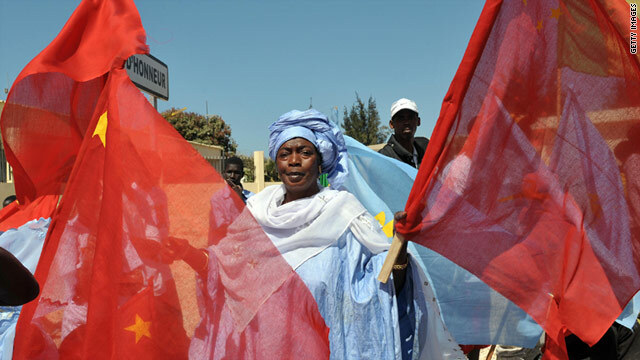 China's growing influence in Africa is creating nervousness in the West, say analysts. In a series of reports, CNN's Marketplace Africa looks at China and India's growing involvement in Africa, and what that means for the continent's economic future. (CNN) -- With Chinese yuan and Indian rupees increasingly finding their way into Africa's economies, Western powers are worried that they are losing influence in the resource-rich continent, according to analysts. Driven by their appetite for natural resources, trade opportunities and political alliances, emerging powers such as China and India are moving from the sidelines to the center stage in Africa -- a region the West has long considered to be its own trading partner. While Western countries are still important players in Africa's energy sector, the deepening engagement of China in Africa's infrastructure, mineral sector and telecommunications is creating "deep nervousness" in the West, says David Shinn, the former U.S. ambassador to Burkina Faso and Ethiopia. The competition in these areas, he explains, usually pits big Chinese enterprises that are financially backed by Beijing's deep pockets against Western companies that often have shareholders to consider and are by-and-large acting independently of their governments' desires. "If the Chinese government wants to encourage an engagement in the Democratic Republic of the Congo, they can make it happen," says Shinn. "If the United States wants its companies to get involved in the DRC all they can do is say 'look, there's an opportunity there, why don't you go explore it' and if they want to explore it, they do and if they don't they don't." According to Shinn, this different system of government "does create anxieties" because "the United States and the West see China filling all kinds of voids that it thought it would eventually fill." China overtook the United States as Africa's biggest trade partner in 2009, according to OECD figures, whereas in 2000 the United States' trade with Africa was three times that of China's. India's bilateral trade with Africa jumped from around $1 billion in 2001 to about $50 billion last year. 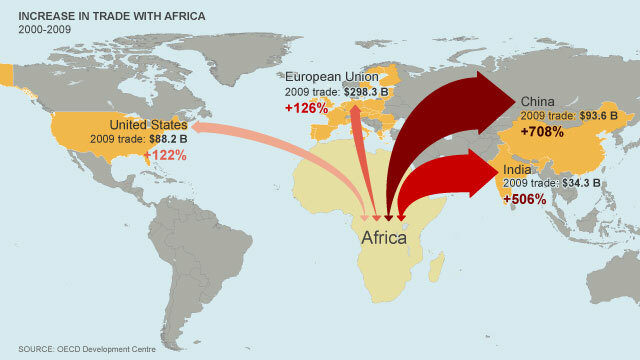 The European Union still accounts for more than 40% of Africa's trade but the share of Africa's trade with the EU and U.S. fell from 77% to 62% over the last decade. At the same time, the share for new economic forces -- China and India but also countries like Brazil, Turkey and South Korea -- rose from about 23% to 39%. China's first official aid project in Africa took place in the 1960s, and in 1975 it completed construction of the iconic Tanzania-Zambia railway. In the early 1990s, when headline-writers would often label Africa as the "failed continent," Beijing decided to step up its foray into the continent, filling the gap left by an exodus of Western investors. "Just as Western companies were mothballing mines, walking away, certainly not bringing new investments, China plunged in and dared to go where the white man feared to tread," says Richard Dowden, director of the Royal African Society, based in London. "It was quite amusing to see the Western mining companies, who'd been shrugging their shoulders at Africa and looking elsewhere, suddenly rushing back in." The emergence of China as a major player in Africa has prompted many Western countries to change their strategies on the continent and emphasize the need for collaboration. "Earlier on, you heard (U.S.) officials maybe talk about China as a threat or as a competitor in Africa," says Richard Downie, deputy director of the Africa program at the Center for Strategic and International Studies. "All the language from officials now is about Africa as a place where competition is good ... and all the efforts here (in the United States), at least in public, are about seeking areas for cooperation and collaboration with China -- so the language has shifted." Yet concerns about China's role are still being voiced in public. When U.S. Secretary of State Hillary Clinton was asked about China's growing influence in Africa, during her visit to Zambia in June, she said that Africa must beware of a "new colonialism." Africa is the corner of the world where that declining U.S. influence is most evident. "We saw that during colonial times it is easy to come in, take out natural resources, pay off leaders and leave," Clinton said from the mineral-rich country that has attracted heavy Chinese investment in mining. Although Clinton avoided naming China specifically in her remarks, the suggestion that it could be fostering colonialism in Africa was immediately dismissed by Beijing. Downie says Clinton's comments come at a moment when China's increasing role is creating "a sense of unease" in the United States which echoes a larger debate about America's declining influence as a world power and China's rising prominence. "The U.S. is very sensitive about it at the moment," he says. "Africa is the corner of the world where that declining U.S. influence is most evident," he adds. Ayo Johnson, director of Viewpoint Africa, a media organization dealing with news from the continent, says the growing influence of emerging players has left the West feeling "very rattled" and put African countries in a stronger bargaining position. "It's becoming very difficult for the West to deal with Africa from their usual perspective," says Johnson. "When you've been used to doing business in a particular fashion, when you've been used to dealing in a certain way and then there's an injection of a third or fourth player who risk the entire dynamic -- that's exactly what has happened with India and China and now made it so much easier for Africans and their leaders and their communities to choose among the various investors." Shinn says that to the eyes of many African leaders China's capacity to move fast, coupled with its policy of non-interference in other countries' internal affairs, often makes Beijing a more attractive partner than the West, whose policy in the continent is usually linked to conditions about good governance and human-rights reforms. One of China's big advantages is that "the Chinese have no mission, no intention at all to change Africa," agrees Dowden. He adds: "There's still a narrative in our minds in the West that Africa is backward and Africans have got to become like us -- 'we have got to change them' -- I think that Africans feel that and the young African generation that's coming through are now very resentful of that." Is the West losing out in Africa? With Chinese yuan increasingly finding their way into Africa's economies, Western powers are worried that they are losing influence in the continent. Interest in Africa by China and India requires a new economic approach, says Calestous Juma. India: Africa's new best friend? While China has used its economic clout to forge ties with Africa, experts say India is hoping soft power can win it friends on the continent. China and India have made no secret of their desire to engage with Africa as they seek new economic partnerships to fuel their booming economies. China and India have been rapidly forging new economic partnerships in Africa.